Like some of his Doncaster team-mates second-rower Jack Walton has had to be patient at times this season. “Obviously everyone wants to play every week but when you have a big squad and everyone is fit some players are not going to start every game,” he said. 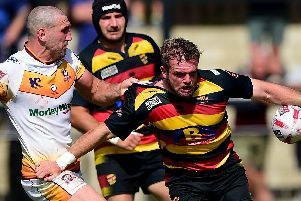 The former Wakefield Trinity Academy forward, who joined the club 18 months ago, has started in three of the last five games and is hoping he did enough in Sunday’s win over South Wales Scorpions to retain his place in the side to visit London Skolars on Saturday week. “A lot of the things we do in training are game-related so that when anyone comes into the side after being out for a few weeks they are ready to go straight back in and hopefully do themselves justice,” he said. “I was happy with my performance on Sunday and that of the team. I think we showed some good defence and some good attack. The Dons, who remain fifth and just a point adrift of second-placed Rochdale, are without a fixture this weekend and could lose ground. But Walton remains confident that the Dons can finish in the top four in the regular season which ends at Spotland early next month, and then go on and make an impact in the play-offs. Walton knew more than most of the Doncaster squad what to expect in League One having spent time at Oxford on loan last season. “I knew it wouldn’t be easy to bounce straight back this season following relegation and the league has got even tougher this season,” he said. “Clubs are attracting big names and the new Toulouse side are full-time. They are obviously one of the favourites to go up this season. “They are particularly strong at home and are a very fit side, as you would expect them to be being full-time.